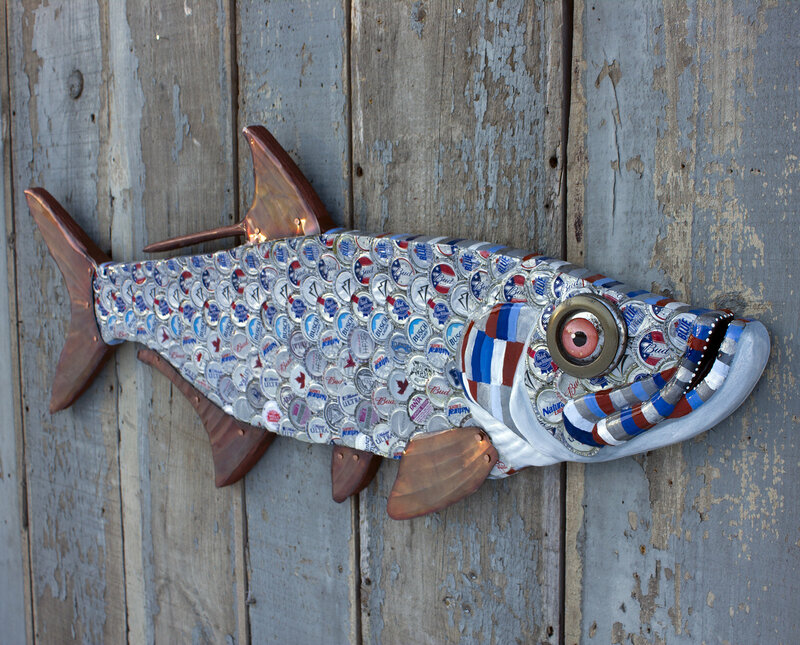 Tarpon Fish Wall Sculpture Bottlecap Art 38"
This bottlecap Tarpon has got serious attitude and would look awesome swimming above the bar, over the mantel or anywhere you want to make a statement. 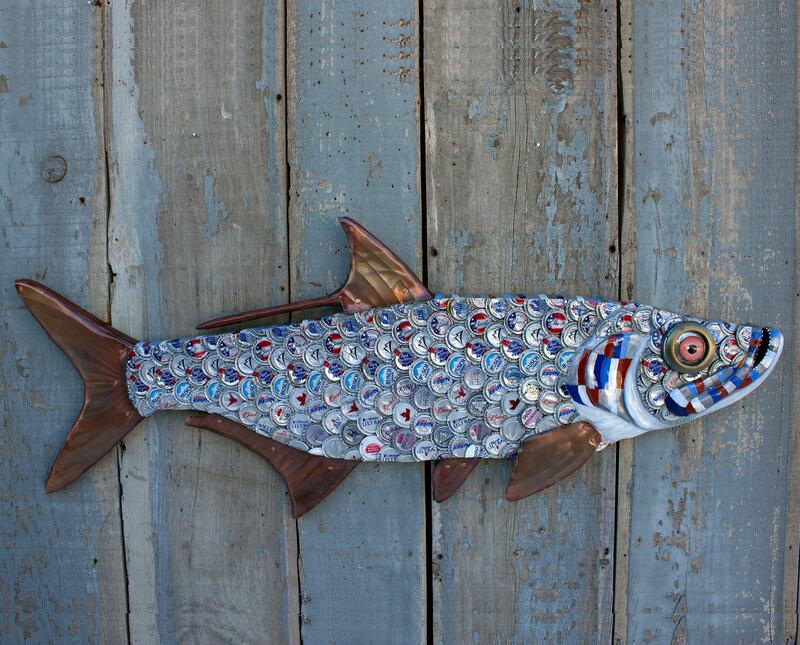 This piece is carved from wood, I hammered and attached LOTS of silver toned bottlecaps in the armored scale pattern characteristic to a Tarpon...they are such a cool fish. I painted the gills, mouth and sides in many shades and tints of compatible colors and poured resin over everything to lock the caps in place and also add a nice shine!The fins are copper that I hammered and oxidized for a nice patina that looks amazing against the metal caps. I reverse paint clear glass cabochons for the eyes and added a little bling behind it with re-purposed metal . 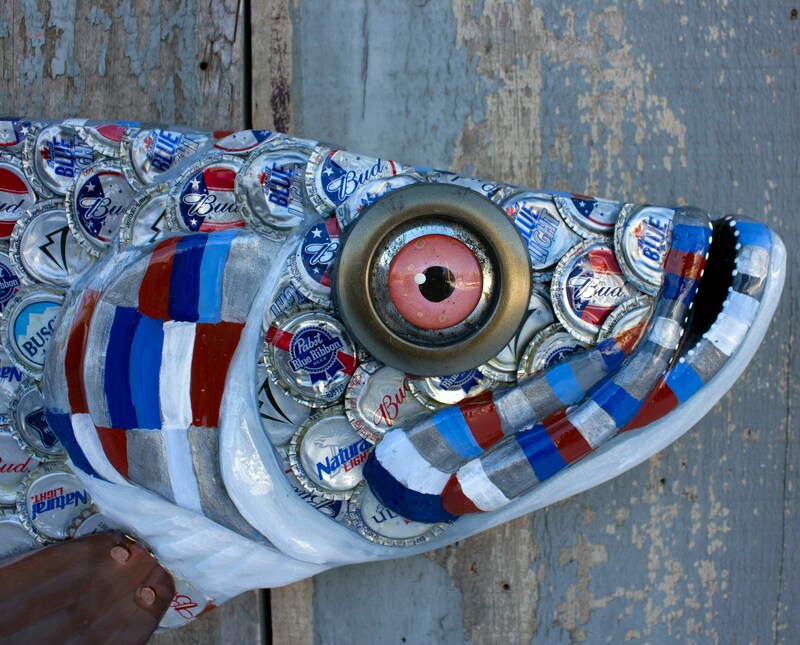 This particular fish would look great over a bar, swimming in a mancave, or hanging over the mantle. 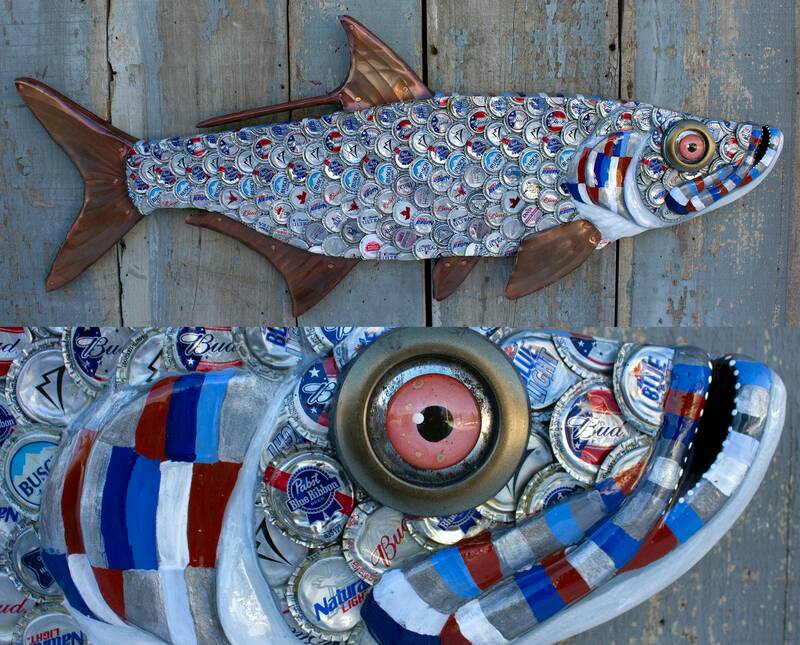 A conversation piece for fish and beer lovers and a chic alternative to taxidermy. The fish is signed and dated on the back and includes a hanging wire and hook for easy mounting. This piece is in stock and ready to ship tomorrow! FREE SHIPPING via Fed Ex Ground to the lower 48 States I am willing to ship outside the country message me for a shipping quote. *I want happy customers! If you order and are not totally psyched with your artwork feel free to return within 30 days for a full refund. Rachel Laundon Art accepts all major credit cards and paypal. This website is operated by Rachel Laundon Art. Throughout the site, the terms “we”, “us” and “our” refer to Rachel Laundon Art. Rachel Laundon Art offers this website, including all information, tools and services available from this site to you, the user, conditioned upon your acceptance of all terms, conditions, policies and notices stated here. Our store is hosted on Etsy. They provide us with the online e-commerce platform that allows us to sell our products and services to you. In no case shall Rachel Laundon Art, our directors, officers, employees, affiliates, agents, contractors, interns, suppliers, service providers or licensors be liable for any injury, loss, claim, or any direct, indirect, incidental, punitive, special, or consequential damages of any kind, including, without limitation lost profits, lost revenue, lost savings, loss of data, replacement costs, or any similar damages, whether based in contract, tort (including negligence), strict liability or otherwise, arising from your use of any of the service or any products procured using the service, or for any other claim related in any way to your use of the service or any product, including, but not limited to, any errors or omissions in any content, or any loss or damage of any kind incurred as a result of the use of the service or any content (or product) posted, transmitted, or otherwise made available via the service, even if advised of their possibility. Because some states or jurisdictions do not allow the exclusion or the limitation of liability for consequential or incidental damages, in such states or jurisdictions, our liability shall be limited to the maximum extent permitted by law. You agree to indemnify, defend and hold harmless Rachel Laundon Art and our parent, subsidiaries, affiliates, partners, officers, directors, agents, contractors, licensors, service providers, subcontractors, suppliers, interns and employees, harmless from any claim or demand, including reasonable attorneys’ fees, made by any third-party due to or arising out of your breach of these Terms of Service or the documents they incorporate by reference, or your violation of any law or the rights of a third-party. These Terms of Service and any separate agreements whereby we provide you Services shall be governed by and construed in accordance with the laws of 290 Barnes Hill Road Waterbury Center, Vermont US 05677. Questions about the Terms of Service should be sent to us at rachel@rachellaundon.com. Shipping is FREE to the lower 48 states for all standard sized fish. 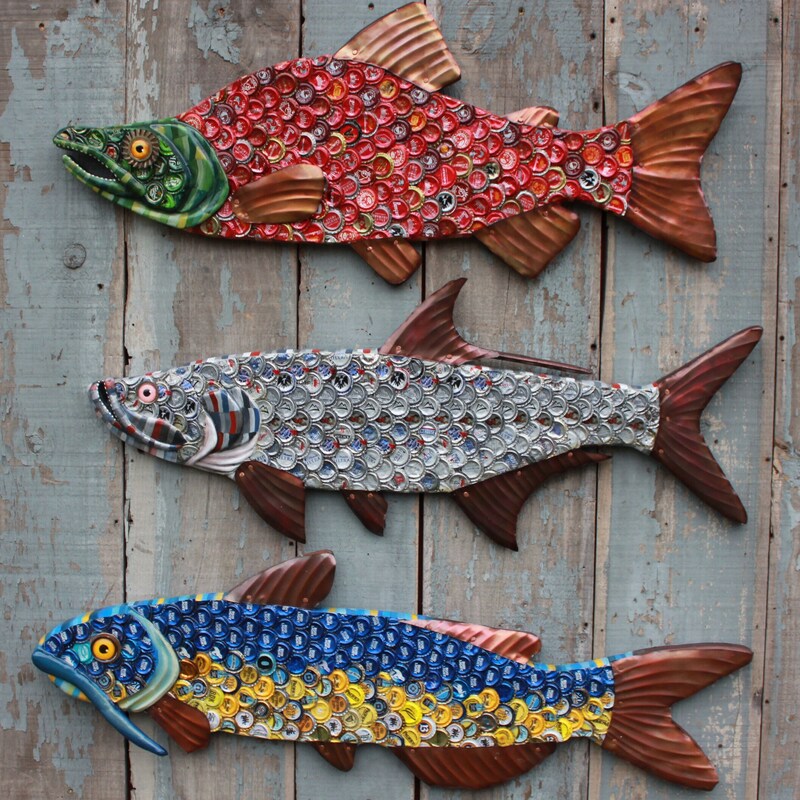 Extra large fish and custom pieces may require shipping charges. 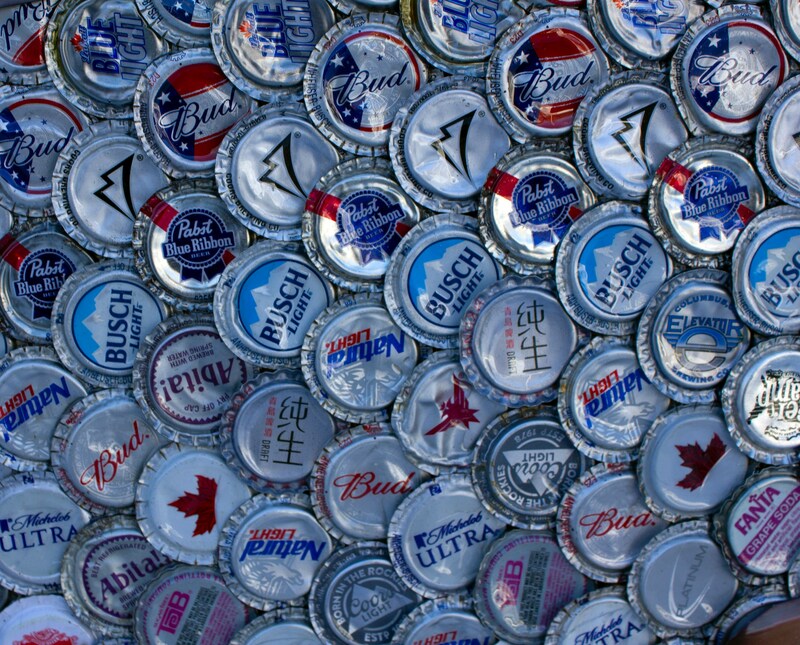 Pieces are wrapped and packaged to ensure safe delivery but just incase we include $100 of insurance. The cost of return shipping (if applicable) is not refunded or reimbursed and are the responsibility of the purchaser. The return policy is 30 days. If 30 days have gone by since your purchase, unfortunately we can’t offer you a refund or exchange. Once your return is received and inspected, we will send you an email to notify you that we have received your returned item. We will also notify you of the approval or rejection of your refund. We do not refund or reimburse for the cost to return the item.